Deciding to take a vacation in Hawaii is easy! More than 25 million years ago, a chain of volcanic islands emerged from the sea. The volcanoes that rose last, far to the Southeast, became the Hawaiian Islands. According to the Polynesian legend, Hawaii was discovered by Hawaii-Loa, an adventurous sailor who often disappeared on long fishing trips. During one of his voyages, he came across a mountainous island chain that spewed smoke and lava. This was Hawaii. Visiting Hawaii can be a romantic adventure, a relaxing vacation, and a fun place for kids to run and learn about the Polynesian culture. If your in the mood to relax, adventure, exercise, or you want a romantic get away, Hawaii offers it's warm water, delicate shores, wonderful food, and beautiful culture and more! 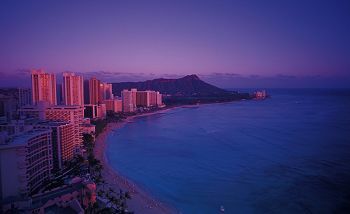 Hawaii has a stunning variety of beaches that vary in shape, size, wave action and sand color. They can be found on almost every point on the compass on any given island, at any time of the year. And, Hawaii's beaches offer the visitors and locals alike nearly every water activity under the sun. Canoeing, kayaking, scuba, Snuba or snorkeling. Or how about surfing, windsurfing, water skiing and more? Or maybe you just want to lay out and soak up the sun. Visit Waikiki Beach, the world’s most famous shoreline, with its newly renovated promenade and timeless vistas and gentle surf. Waikiki's two-mile stretch of sand is the home to a plethora of ocean activities. But many sun worshippers opt to just stretch out and relax. Or escape to Kauai's Lumahai Beach, a secluded finger of sand that twists around a rocky cliff. It was here that the classic musical South Pacific was filmed. Little has changed since 1958 when they shot the film. Then again, little has probably changed since 1858. Want to watch the wind? Then journey to Maui's Hookipa Beach, just outside of Paia and the airport. With a steady and strong breeze and good-sized waves, daring windsurfers perform graceful acrobatics. Share the reef with a World War II Liberty ship run aground at Lanai's appropriately named Shipwreck Beach. Wreckage was never so peaceful. Or get lost in the solitude of Molokai's Halawa Bay, where you can snorkel, fish and swim, protected from the raging surf, far far away. How about visiting the Big Island's Kaunaoa Beach also known as Mauna Kea Beach. This crescent of sand lies at the foot of a steep lava cove. The beach itself is long and wide and is excellent for swimming. You can explore a patch of sand, no matter how big or small -- just make sure you use a designated public beach access.